Bahrain: What lies behind the scenes of the Formula One Grand Prix? Photo by Hasan Jamali/AP/REX/Shutterstock. 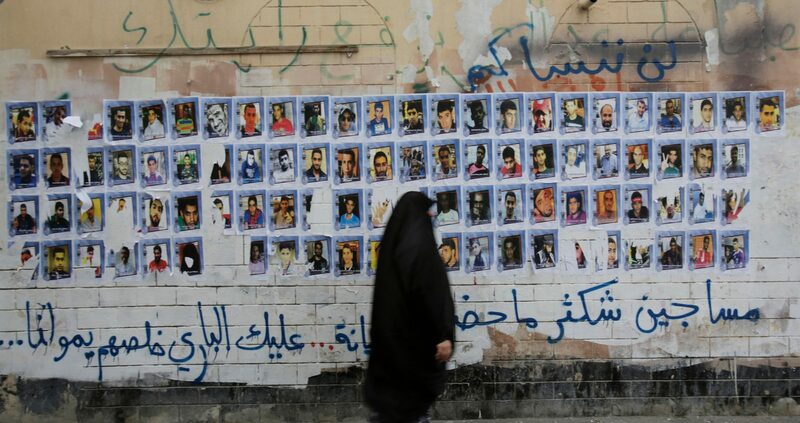 A woman walks past images of political prisoners plastered on a wall in Sanabis, Bahrain. Graffiti at top reads, "we will not forget you," and at bottom, "Many prisoners are not with us. May God free them." Last weekend the world tuned into Bahrain’s International Circuit and watched one of the glitziest events on the sporting calendar: Bahrain Formula One Grand Prix. But step away from the high-powered cars and the spectacular circuit, you’ll see that Bahrain’s human rights record is not so shiny. Here are five things happening away from Bahrain’s prestigious circuit. Social media posts critical of the government can land you in jail. Nabeel Rajab, a prominent human rights defender, is serving a five-year sentence for tweeting about the conflict in Yemen and about torture allegations in Bahrain’s Jaw prison. Similarly, Najah Yusuf is in prison for publishing tweets that included criticism of the F1 races. Following yet another crackdown in 2016, most human rights defenders in Bahrain are now jailed, silenced or forced to move abroad. Sayed Ahmed al-Wadaei, a Bahraini human rights activist, sought refuge in the UK in 2012 after he was detained, tortured and sentenced to six months in a Bahraini prison by a military tribunal. Willing to stop at nothing, a year ago, the Bahraini authorities arbitrarily detained Sayed’s mother-in-law, brother-in-law and cousin in retaliation for his continued human rights work in exile. The government continues to resort to revoking citizenships and therefore rendering hundreds stateless, for “crimes against national security”. So far since 2011, more than 800 people have been stripped of their nationalities. Of those, 115 people lost their citizenship following a ludicrous mass trial that relied on confessions extracted under torture. In a recent investigation, Amnesty revealed a pattern of medical negligence in Bahrain’s Jaw prison. In some instances, individuals with serious conditions like cancer, multiple sclerosis and sickle-cell anaemia have been denied specialist care and medication. Last year, Bahraini authorities stepped up their brutal crackdown on opposition societies by passing a law that bans “active leaders and members of dissolved political associations” from running for office. As authorities dissolved the country’s main opposition groups (Waad and Al Wefaq) last year, leaders and members of those societies can no longer stand in elections. While Hakeem al-Araibi has now found safety in Australia, he is still speaking out for others in Bahrain who face injustice. Read Amnesty International’s latest Bahrain human rights review.